in snow. Yesterday Sunday it was snowing from morning to evening, so now I can see nothing for the snow in my little garden, as both snow drops and winter aconite are buried in snow. Hannibal the Cat is NOT HAPPY about this development in the weather, as he hates having snow in his fur, so yesterday he spend most of the day in-side looking out on the snow flocks. 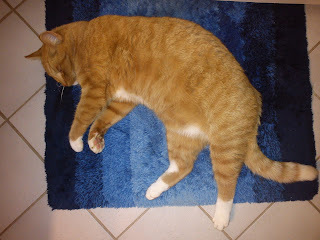 Also today he has spend the majority of the day in-side, as it was been very windy and cold with temperature below 0'C. Hannibal the Cat is an active out-door cat easily spending 10-12 hours or more outside, so it is frustrating for him sleeping the entire day away in-side. 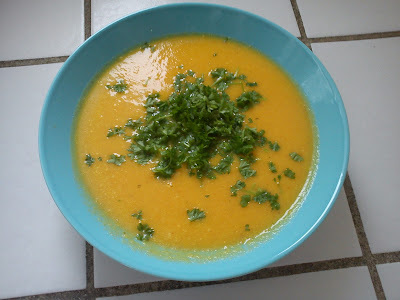 I found this recipe on carrot soup in the issue 03/2012 of the weekly magazine "Femina", and as I had most of the ingredients I decided to test the soup, even though that I so fare never has tasted a carrot soup, which I actual liked !!!! And luckily for me, I really like this version of carrot soup, so I will make it another time again. Next time I will increase the amount of fresh ginger and perhaps add either cumin or chili. As I had some pasternak I decided to replace the potatoes with pasternak, and I also decided to double the amount of whipping cream in order to empty my freezer from a last frozen portion of whipping cream. When ever I have some leftovers of whipping cream I pour it into small 1 dl beakers and placed it in the freezer for later use in soups. Saute the carrot and pasternak in oil in a cooking pot for 5-10 minutes. Add the vegetable stock and let the soup boil under lid for 20 minutes. Add the whipping cream and let the soup cook for another 5 minutes. Season with lemon juice, pepper and salt. 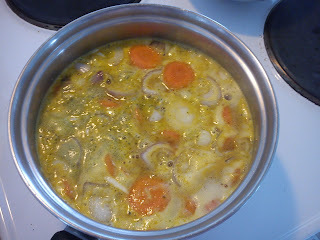 Served the soup, topped with parsley, enjoy together with bread. 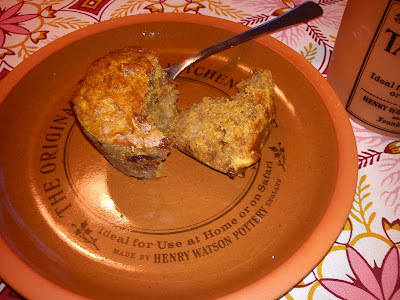 I have found this muffin recipe in the November 2011 issue of Country Living magazine, which is one of my favourite English magazines. I usual get one of my English colleagues to bring me the latest issue, when she is coming to Denmark in connection with work, as foreign language magazines are more expensive to buy in Denmark compared to else where in Europe. However, I decide to make these muffins, as I had some bananas in my little kitchen, which almost over-riped. And afterwards I noticed, that they does not contain any milk products, which means, that they perfect for picnic rows, as one of my rowing friends is sufferings from lactose intolerance. Sift the flour and baking powder into the mixing bowl. Add the spices and sugar, where any lumps have been broken down. Add the oil and beaten egg and stir well together. Add the grated carrots and mashed bananas. Stir well again. 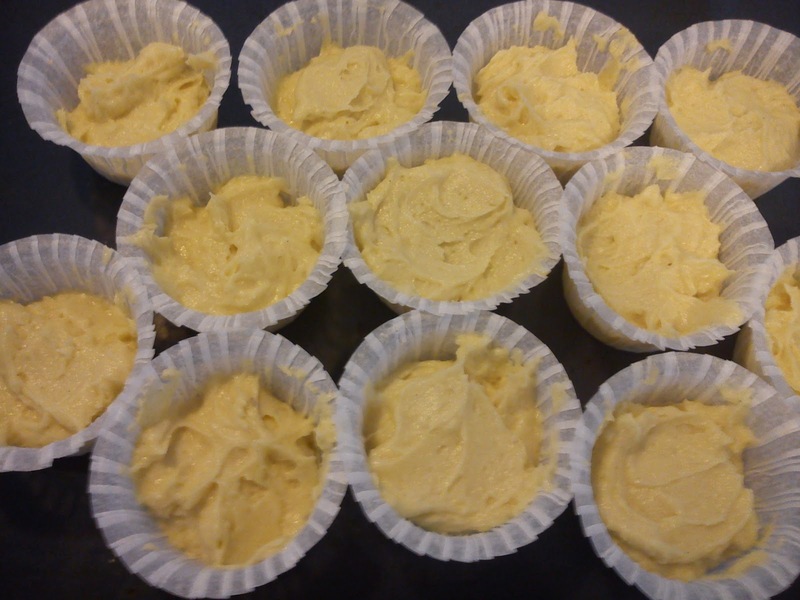 Place the muffin dough in the muffin forms. Bake at 200'C for 20 minutes. Ensure, that the muffins are baked through out, before removing them from the oven. Cool down or place in the freezer for later use. Enjoy together with a nice cup of tea (or coffee). I have also created the actual flavour combination on my very own having the need for lemon and ginger in mind for fighting the cold and flu surrounding you during the Winter season. 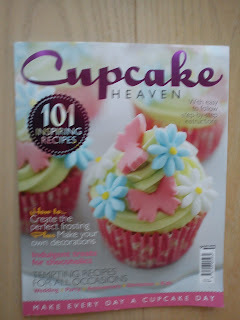 The base cupcake recipe I have found in the magazine "Cupcake Heaven". What to do in an airport, when you have 3 hours to spend waiting for the connection flight ? I like to spend some time in the book stores looking at foreign language magazines as well as book. In December I had a "day trip" to Poland flying out at 6.00 in the morning and returning at 23.30 in the evening at my local airport incl. several hours in both Warsaw and Copenhagen Airport. And what I find in Copenhagen Airport ? 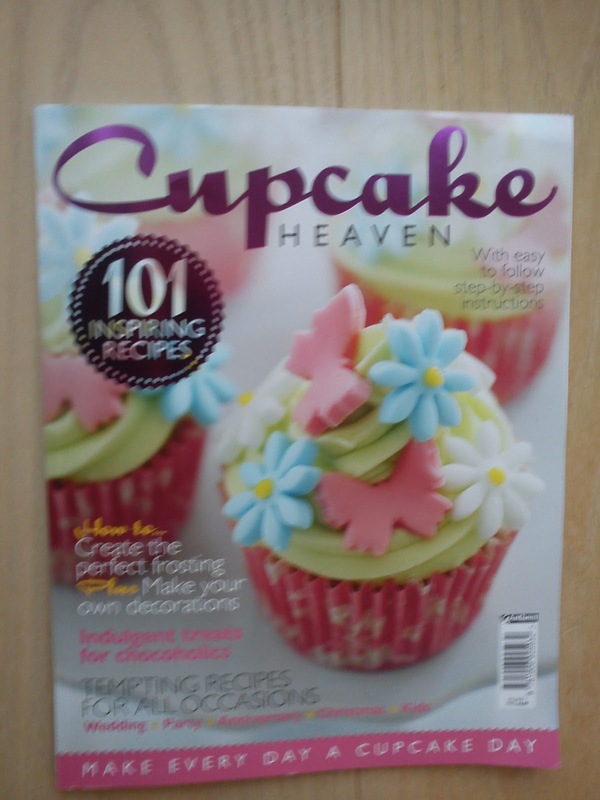 A magazine called "Cupcake Heaven" with 101 cupcakes recipes !!!!! Add the vanilla sugar, lemon peel and juice, ginger and baking powder into the mixing bowl, beat everything together. Bake at 180'C for 15-20 minutes. Meanwhile make the icing from icing sugar and various type of food colour and 1-2 drops of lemon flavour. 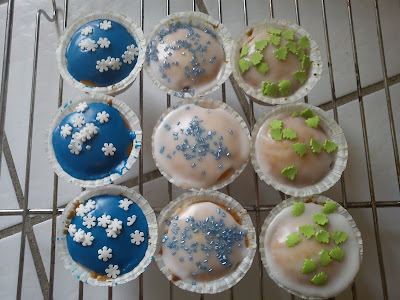 Spread the icing on top of cold cupcake and apply various type of cake decoration within the winter theme. Enjoy and share with people around you !!! Slowly I am cooking my way through the various dinner kits from Urtekram, the first being whole grain lasagna. And the second box tested in my kitchen is chicken with cinnamon and curry. The chicken pieces are coated in a cinnamon mix before roasting them in the oven. The vegetable part (600 g) was made up of carrots, celery, pasternak, onions and cloves of garlic, which first is fried in oil, prior to adding to spelt grains. spices mix and water for boiling this spelt/vegetable mix. 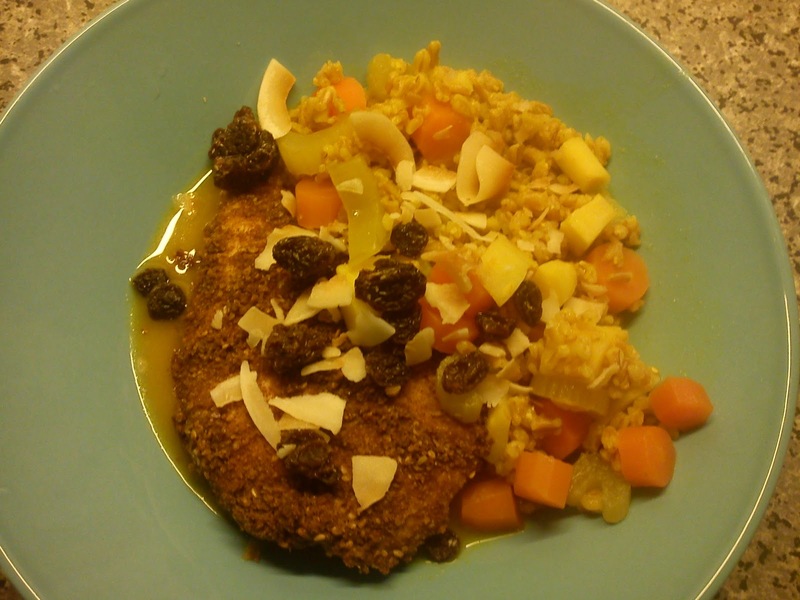 Before serving you are adding coconut pieces and raisins as topping. Replacing some of the water with coconut milk for a more creamy mouth feel. However, the coating of the kitchen with cinnamon mix was excellent. The final question to myself is, would I pay full price for this cinnamon/curry dinner kit ? The short answer to this specific question is NO. 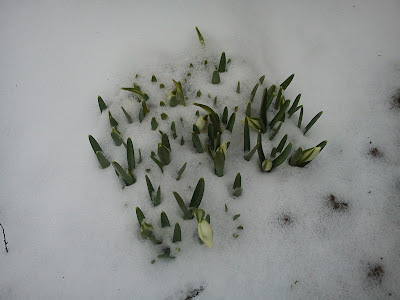 Two weeks ago I noticed, at snow drops had started to put their heads above the ground. As the sun was on from morning to late afternoon this week-end, I went on a flower hunt in my little park. 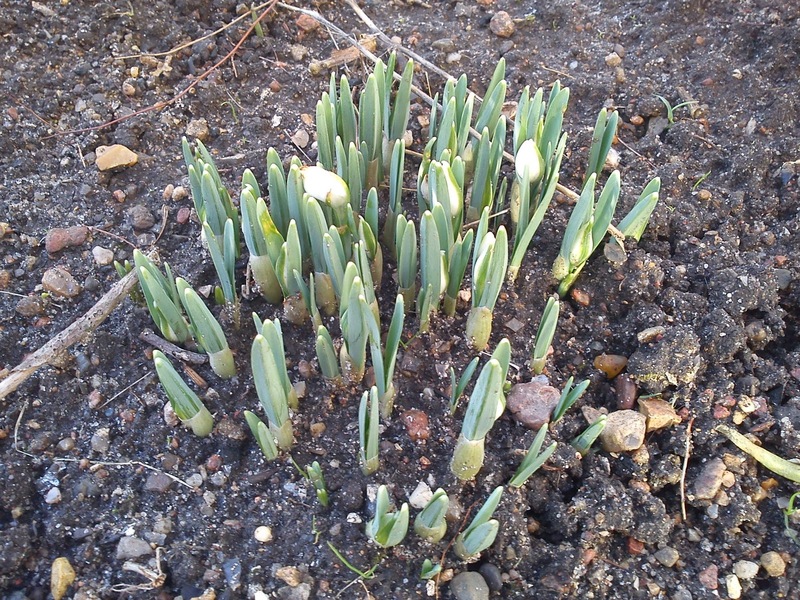 Also the snow drops are now starting to show of their beautiful heads. 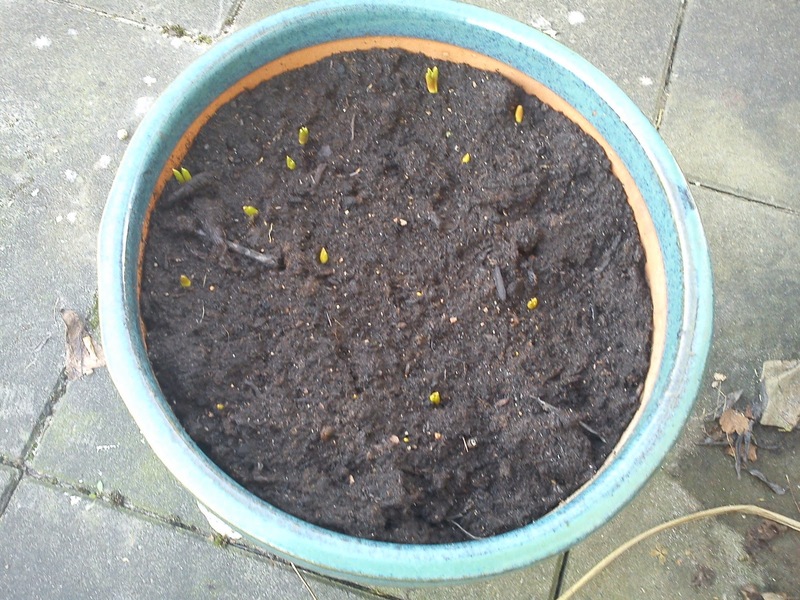 Next to my front door, I have placed one big pot, where the some of the 50 Muscari also are starting to pop some green "stuff" up as well. 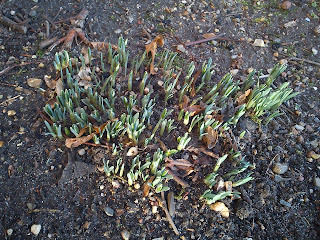 I did first noticed this week-end, when it was day-light, when I walked in and out the front door. This time of the year it dark, when I leave my home as well as arrive back after yet another day at work. This is the second time, where I try to enter into the blog event called "Tea Time Treats", which is a monthly baking challenge event managed Karen from Lavender and Lovage and Kate from What Kate Baked, and the it Karen, which is the host for January month. is Karen at Lavender and Lovage. 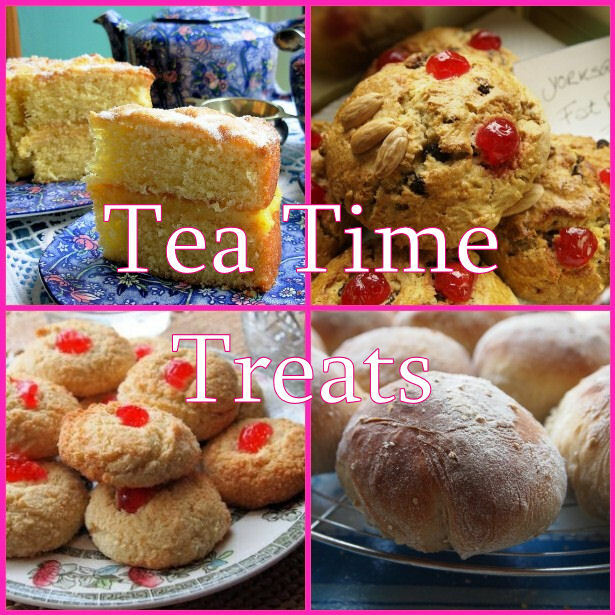 The theme for this month is "Sweer Pastries and Breads" http://lavenderandlovage.blogspot.com/2012/01/new-tea-time-treats-january-challenge.html . So I cross my fingers for, that this banana bread with raisins and walnuts will make this time. 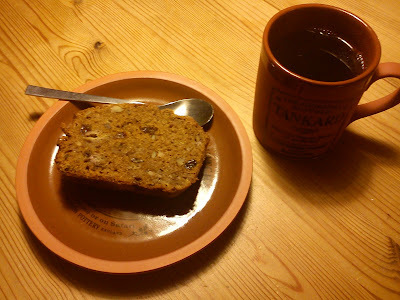 What I love about the banana bread, is the combination of warm spices, raisin and walnuts. And the use of coffee is also giving an interesting flavour twist. Make strong coffee and let the raisin soak in this coffee for approx 30 minutes. Whip the soft butter and brown sugar together, into a homogenouse mass. Whip in the egg, one by one. Add the spices and baking powder into the mass ad whip it together. Add the raisins, coffee left over and walnuts. And stir it into the mass. Add the cake flour and stir well into the mass. Mash the bananas, before stirring them into the bread/cake mass. Line a loaf form with baking paper. Fill the bread/cake mass into the foam. Bake the bread/cake at 175*C (conventional oven - starting from a cold oven) in lower part of the oven. Bake the bread/cake for 1 hour and 10 minutes. Cold down the cake/bread, before you cut slices of it. Enjoy this banana bread together with nice cup of tea. As I was making my very first of portion of caramel with liquorice a la Klidmoster, I thought, I would make my very own flower twist to these caramels based on honey and white chocolate using lavender honey and dried lavender. Yesterday at work I gave my colleagues the option of tasting both the liquorice and lavender caramels. My foreign colleagues actual like these lavender caramels, and my French colleagues kept digging into the container with lavender caramels !!! I used 1 teaspoon of dried lavender, which is to the more soapy side concerning the flavour profile, so I would recommend you to start with ½ teaspoon of lavender. I imaging, that a good girl friend of mine living in Horsens it going to have serious nightmares about, when she reads this specific posting. So I will already now write, that the last lavender caramels disappeared into my mouth yesterday evening. The texture of these caramels were more to the soft side compared to the liquorice caramels, this is perhaps related to the applied honey ? 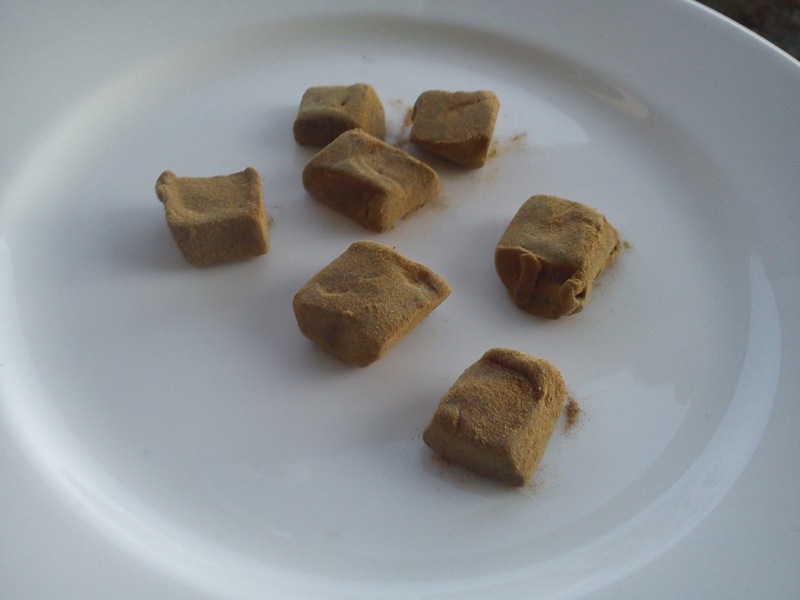 Melt the honey in a Microwave Plus pot at 20 seconds at 650 W in the microwave oven. Add the dried lavender into the honey, stir well. Heat for 40 seconds at 650 W in the microwave oven. Heat for another 20 seconds at 650 W in the microwave oven. Stir very well this time. If the white chocolate is not melted now, give it another 5-10 seconds at 650 W.
Line a container with baking paper. Pour the caramel mass into the container. Cool it down in the refrigerator for approx 1-1½ hours. Take the caramel mass out and cut into small pieces. I have found this recipe on caramels with liquorice made from honey and white chocolate on the blog called Klidmoster. 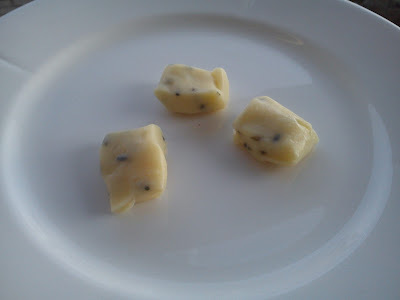 And as I still had some white chocolate left from my Christmas marathon of confect creation, I decided to try the recipe out. I had wanted to this for some time, but the raw liquorice powder was SOLD OUT at my local tea pusher, and they first got a new shipping last week !!!! Normally I am not "mixing bowl licker", but this time very single drop of the caramel mass did not to waste, but ended up in my mouth. Uuuuhmmmm :-) FANTASTIC TASTE. And a BIG THANK YOU to Klidmoster for sharing her caramel recipe with the rest of us with a "sweet tooth". Today I brought some of these caramels with me to work for sharing with some colleagues. 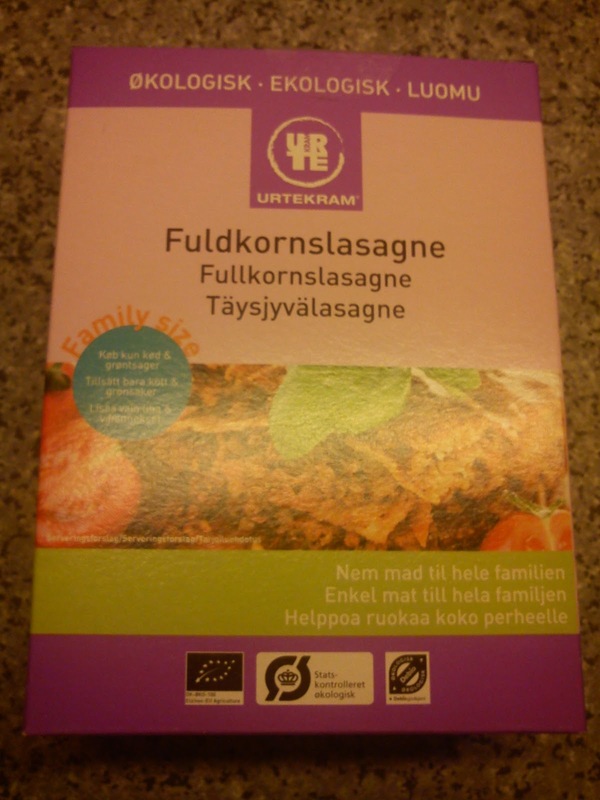 My Danish colleagues also found them great tasting and planned to try them in the week-end. However, my foreign colleagues either rejected to taste them or tasted with them with some sort of dislike. These non-Danish colleagues simply do not understand this liquorice gene of us Danes !!!! And we as Danes do not understand this liquorice dislike of foreigner, but perhaps where is not enough liquorice in the world for the majority of people to get a craving for liquorice ? Perhaps I would like to increased the lemon taste next time, when I make these caramels with 1-2 drops of lemon flavour ? Melt the honey and lemon peel in Microwave Plus pot at 20 seconds at 650 W in the microwave oven. Add the raw liquorice powder into the honey, stir well. Add these pieces into English liquorice powder, shake well. Recently one of my working colleagues gave me a tip on how to give a more soft texture in marzipan cakes simply by freezing the baked marzipan cakes. This tip made me curious, so I decided to make a test on these marzipan cakes with clementine and Cointreau, which I baked two days ago. So after baking and cooling of the marzipan cakes I placed two of the cakes in my kitchen freezer at -18'C for one day. Today at the afternoon coffee/tea break today at work some colleagues and I made a comparison between the unfrozen and the frozen version of these cakes. And yes, freezing is giving a more soft texture to the inner part of the cake, but and this is big BUT the flavour of citrus and Cointreau completely disappeared during the freezing step. This lack of flavour is a big draw back in my opinion. So freezing can be used, if you have baked your plain tasting marzipan cake a little to much as a way of getting a soft marzipan cake. 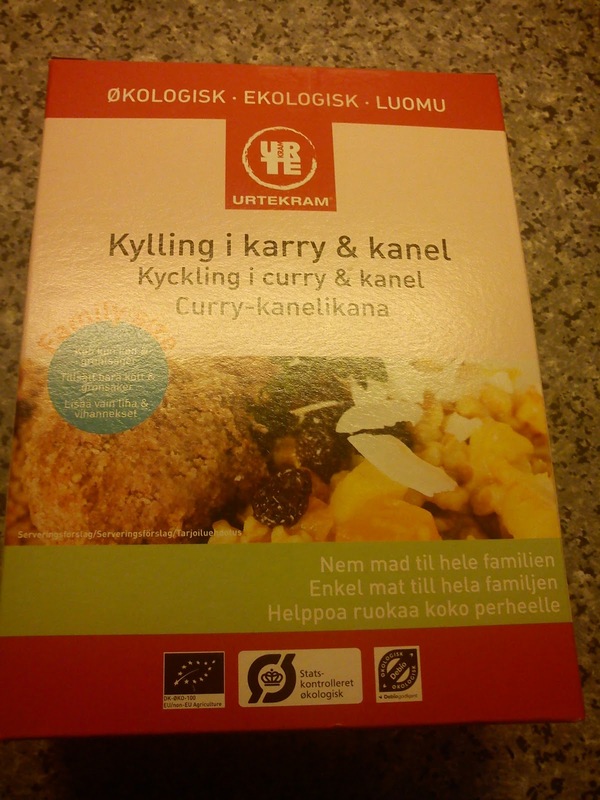 As I was able to buy this dinner kits from Urtekram at very good price as "here & now" offer in Fakta I decided to try the entire collection of these dinner kits. My "first" trial was using the whole grain lasagna kit, where you need to have minced meat, various vegetable and grated cheese as minimum beside for the actual dinner kit box. As extra supplement you also add tomato concentrate as well. As vegetable I used 100 g carrots, 100 g leek, 100 g celery, 1 onion, 2 cloves of garlic and 200 g tomato concentrate. For the cheese topping I mixed the required 140 g of grated cheese with 40 g grated Parmesan cheese. 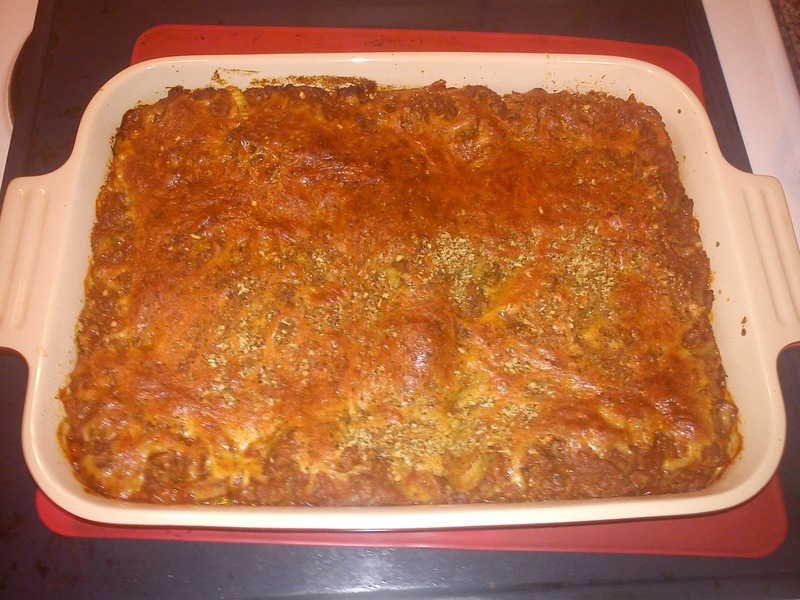 The final lasagna turned pretty well using these extra supplements of garlic, tomato concentrate and Parmesan cheese. I did not miss the lack of bechamel sauce, which is not a part of this dinner kit. However, if you have to pay full price for this dinner kit, which consists of lasagna plates and two different seasoning, I think it is too expensive as the tomato concentrate is not a part of it. Using a "normal" recipe on your own, you are actual able to a similar or even better tasting lasagna at a lower price. I am doing "my best" to use the marzipan, which I got hold off in connection with Christmas. So this evening I decided to combine these two recipes (happy New Year and små marcipankager) from Sweet Nothing into these marzipan cakes with clementine and Cointreau. In these original recipes it is mandarins, which is being used, but I only had clementines, so I took the decision to exchange mandarins with clementines. And honestly I have no idea, what the difference is between these two fruit of citrus fruits ! Optional you could coat the bottom of the marzipan cake with melted dark chocolate. However, I am relaxed / lazy person, so I did not do this. Knead all the ingredients together with your hands. Use teaspoons for placing the marzipan mass on baking paper as small tops or use a pipping bag, if you have strong hands and arms. I never use silicone baking paper, when I am baking marzipan, as it quiet tricky to get the marzipan off after baking. Place a pomegranate kernel in each marzipan top. Bake in the middle of the oven at 200'C for 15-20 minutes. I decided to use some of the left over pomegranate syrup, which I made for the pomegranate champagne drink, for making some marzipan cakes. Before using the pomegranate syrup I decided to reduced with 50%. 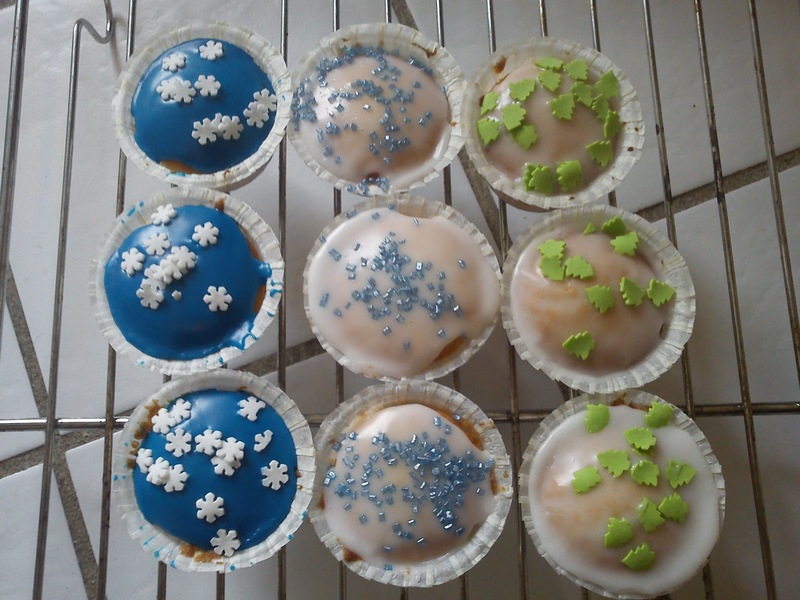 I also decided to use my new Tupperware pipping bag to form these marzipan cakes. I thought it would be like a "walk in the park", but I was so very wrong !!!! Pipping the marzipan cake mass requires plenty of arm muscle mass and strong hands, which I have neither of. So if the Tupperware Alice, who sold my this pipping bag had been in my kitchen, I would have thrown it back at her !!!!! Combining the fresh taste of the pomegranate syrup with the sweet almond cake is a perfect taste combination, which you really to try yourself. Bake in the middle of the oven at 200'C for 10 minutes. During the Christmas month of 2011 I have been enjoying four different Christmas teas in my tea cups, well I am still drinking Christmas tea here in beginning of 2012 !! 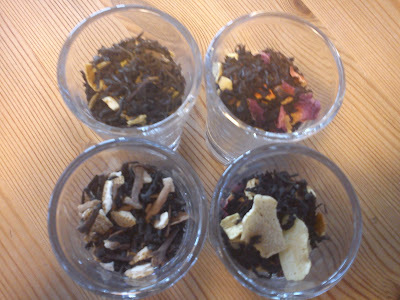 Top right is Adventstee - black tea with mandarin, cinnamon, orange peel and rose petals. The smell and taste of this tea is fresh without being over sweet. This tea is also a popular guest in my tea cup. Down left is Tea Drops Christmas Tea - black tea with cinnamon, cloves and orange peel, everything being organic. The taste is very dominated by cinnamon, it is a good tea, but not at similar preference level for me as the two tea above. Down right is White Christmas from my local tea pusher - black tea with orange, coconut, almond pieces, rose petals and cinnamon. The taste is to the sweet side for me, drinkable, but not perfect like the first two teas. I have found this specific recipe on pomegranate champagne drink in "Alt for damerne - week 51", when I was at the hair dresser just before New Year. 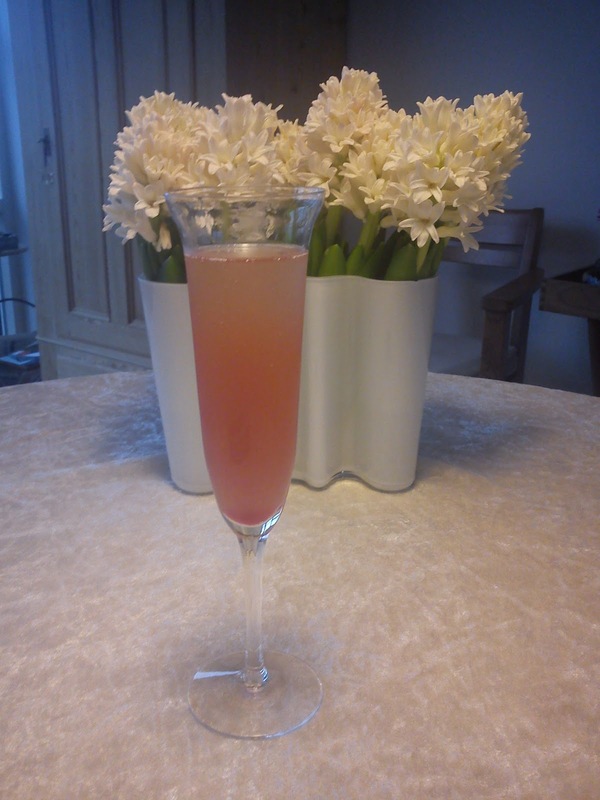 And yes, I do know it is one whole year to late to use this pomegranate champagne drink for celebration of New Year. Perhaps you are having a hang-over here on the very first day of a whole new year, so alcohol is not on your agenda for today. If this is the case, you can always use the pomegranate syrup in sparkling water or plain water. Any rest of the pomegranate syrup can be stored in the refrigerator for 1 week or frozen down in the freezer. Fill 1 tablespoon of this pomegranate syrup into a champagne glass. to you from Hannibal the Cat and I. 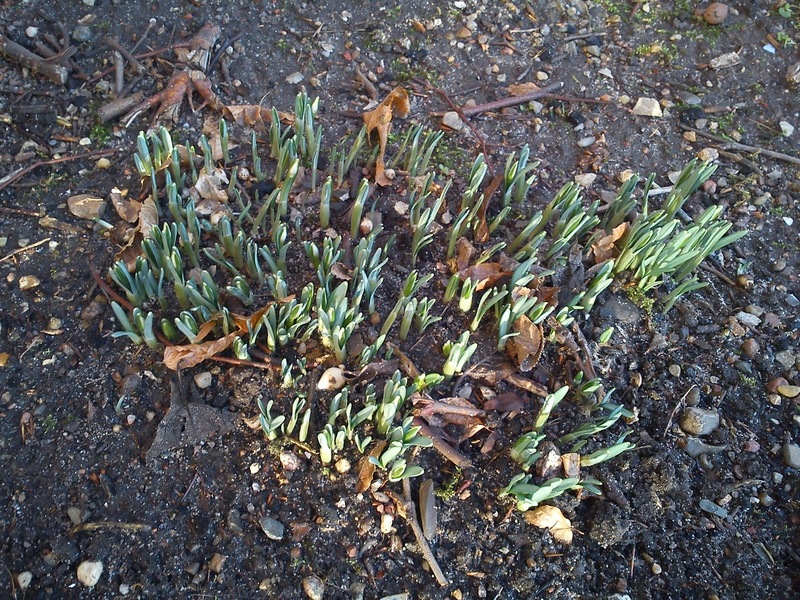 We hope you will get an exciting and healthy new year here in 2012 with more sunshine than rain and hurricanes. 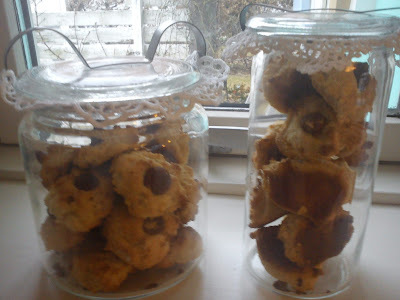 Here in 2012 I hope I will make greater progress on baking my way through "Hjemmebagt". Baking 12 recipes per year, mean I will finish with this task of mine in 5 years time from now, so in the end of 2016 !!!! 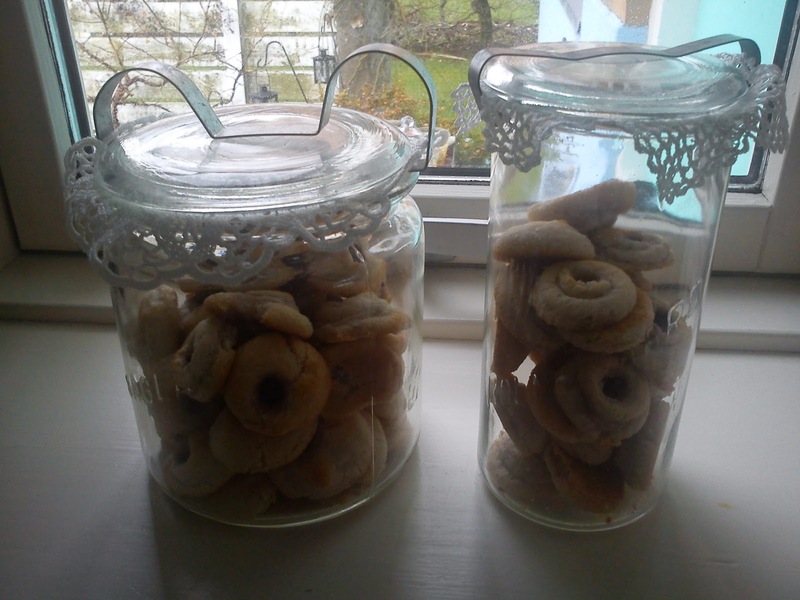 So one of my New Year´s resolution is to bake more than 12 recipes from "Hjemmebagt" here in 2012. Another of my New Year´s resolution is also to become better at using the seasonal herbs, flowers and fruits, which you can collect for free in nature. I am quiet good in using the elder flowers, but ramson is still a unknown herb/green for me and my kitchen. 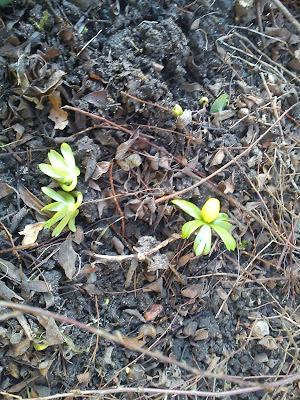 I would also like to work more with sloe and elderberry here in 2012. 2011 was an active year in relation to putting the summer on bottle, and these activities I hope to continue here in 2012, making the necessary adjustments based on the sensory evaluation of the fruit alcohols of 2011 with the helping mouths of some great friends. 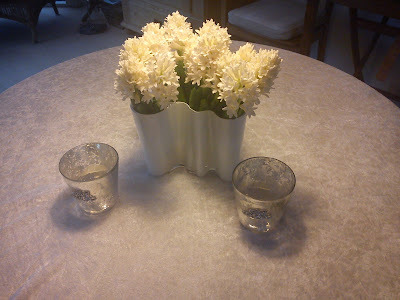 2011 was also the year, where the weather was behaving "better", when I invited friends for entertainment in my little "park" like afternoon tea in garden and barbecue evening with tea light. 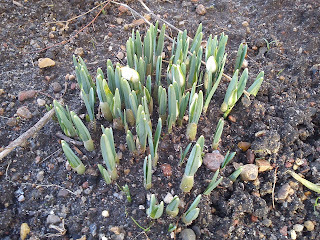 Hopeful 2012 will bring similar weather without rain for such out door "dining in" events in the garden. 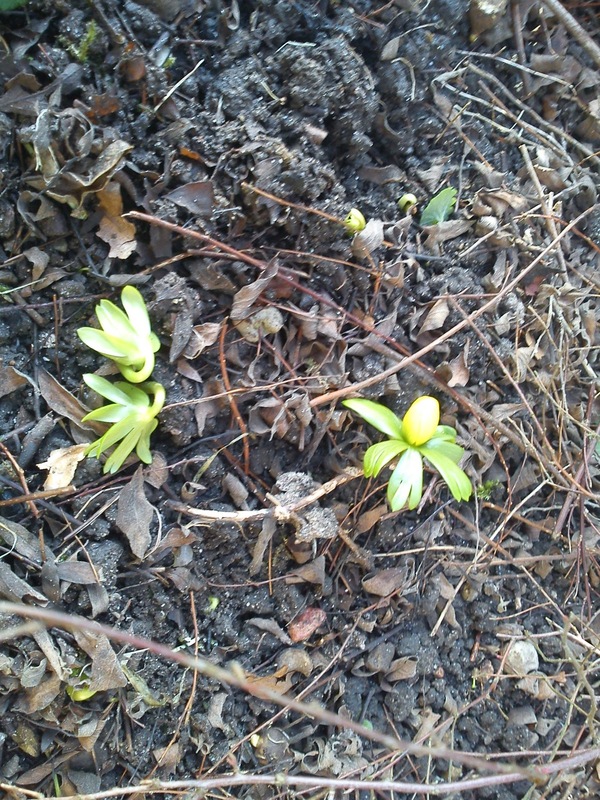 In 2011 I also spend some time growing herbs, potatoes, tomatoes, apples, raspberries and fig in my kitchen garden, hopeful 2012 will bring more apples and figs than 2011, a more detailed satus can be seen here status on 2011 in my kitchen garden. I will also keep you updated in 2012 on the progress in my kitchen garden. Christmas 2011 was a busy time here on the blog, as I decided to make my very own Christmas Calendar with daily post presenting eatable as well as drinkable Christmas food. I was having a lot of fun doing this, so even though that the out come of the review poll relating to the Christmas Calendar shows, that 3 persons out of 4 persons in total do not think I should spend time on making a 2012 version of such a Christmas Calendar, I will overrule this decisions of yours, as it is my kitchen and my blog and I am having great fun doing this !!!!!! So stay away from Kitchen of Kiki in December 2012, if you do not want to follow this Christmas Calendar. So my third New Year´s resolution is to make a 2012 version of a Christmas Calendar, and I have already been thinking to have a theme on family recipes from around the world and/or Denmark, which work colleagues as well as friends would like to share with you in my little kitchen. My rowing friends are really enjoying to go on rowing tours together with your decisions about the type of muffin or cake, which I should have been baking using the outcome of these "row cake polls". So please continue to vote on the "row cake polls" here in 2012. As a final New Year´s resolution I would like to work more with different kinds of drinks and cocktails with and without alcohols in my kitchen, so CHEERS to all of you.